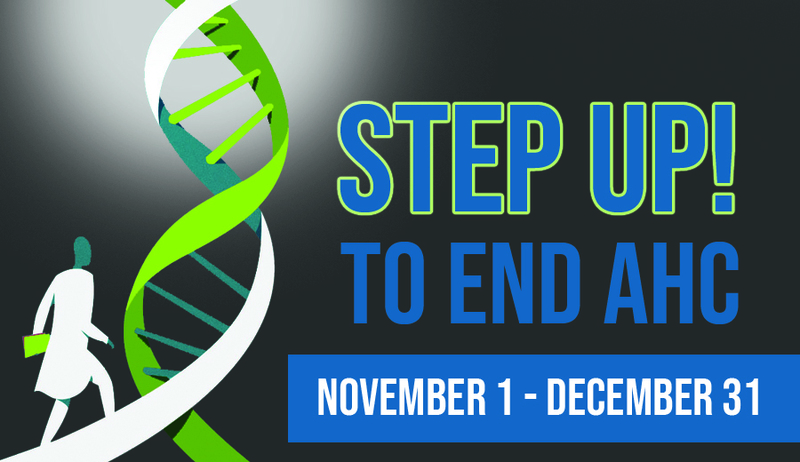 The AHC Foundation is excited to announce the beginning of our year-end campaign called, Step Up 4 AHC. One focus of the campaign is an international collaboration on a new innovative gene therapy project for AHC. In June 2018, Cure AHC presented this project to the AHCF and since then, we have been working as collaborative partners with doctors and researchers to develop a cutting-edge Adeno Associated Virus (AAV) gene therapy. In addition, Simon and Nina Frost have contributed significant funds to the AAV Project through their Hope for Annabel Foundation. And, family foundations in Ireland and the United Kingdom are also joining the project. The AAV Project is an innovative approach for gene therapy using viral vectors to deliver functioning genes to compensate for the dysfunction of the mutated ATP1A3 gene that causes AHC in most patients. The AAV Project involves partnering university-based scientists with The Jackson Laboratory, a private lab facility headquartered in Maine, and Virovek, a private lab in California. Researchers from the United States and around the world are also assisting with this collaborative effort. By leveraging both university-based experts and private lab facilities, the AAV Project hopes to move faster towards a clinical trial and cure for the children and adults suffering from AHC. Representatives of AHCF and Cure AHC have been meeting every other week to collaborate, plan and move the AAV Project forward. The effort is led by Simon Frost from Cure AHC and Meredith Schalick from AHCF, along with Jeff Wuchich and Tony Pena from Cure AHC and Lynn Egan and Joshua Marszalek from AHCF. Our year-end fundraising campaign, Step Up 4 AHC, officially launched on November 1st to help support this venture, which has an estimated total cost of $750,000. We will also continue funding other efforts along with three ongoing research projects. AHCF is a 501(c)3 non-profit organization based in the United States that was created to raise awareness and research funds to develop a treatment and discover the cure for Alternating Hemiplegia of Childhood. Donations to AHCF may be made at www.StepUp4AHC.org or sent to 2000 Town Center, Suite 1900, Southfield, MI 48075. For more information about Alternating Hemiplegia of Childhood (AHC) please visit www.ahckids.org or contact ahcfoundation@ahckids.org.